On June 1, 2018 news began to circulate that the impoundment of the reservoir of the controversial Ilisu Dam on the Tigris River in the Kurdish Southeast of the Republic of Turkey had started. The Turkish State Water Works (DSI) announced that with the closing of the first valves of the three diversion tunnels the filling of the reservoir had begun. This development overlapped with urgent news from Iraq, where the Tigris River had fallen to historically low levels. This situation has resulted in discussions that have become even more urgent in Iraq than discussion of the recent elections. The drought in Iraq is not related to the Ilisu Dam and Hydroelectric Power Plant (HEPP) Project, which is still under construction and is one of the most controversial dam projects worldwide due to its expected grave destructive impacts on people, culture and nature. Work continues at different locations and has not progressed far enough to allow the impoundment of the huge reservoir. For example, the long bridge near the ancient city of Hasankeyf will not be completed before the beginning of 2019. 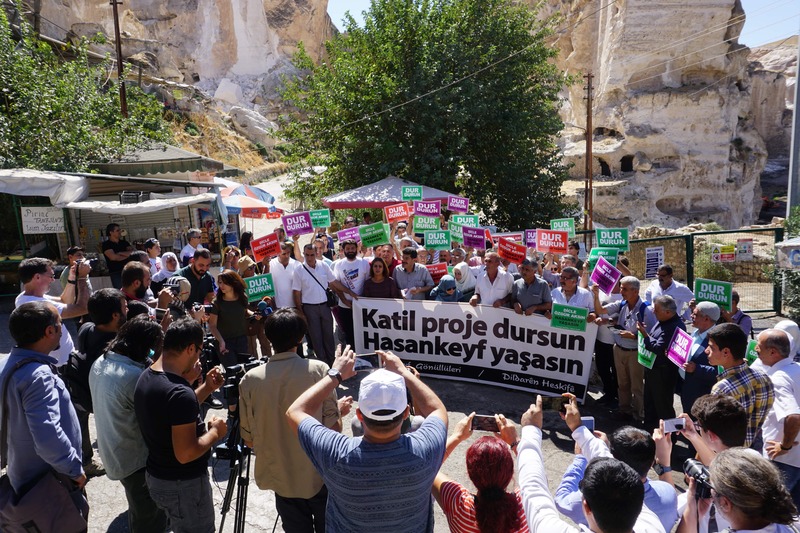 Approximately six monuments in Hasankeyf are planned for relocation to New-Hasankeyf by the end of this year, provided that there is no delay (which has usually been the case ). Furthermore, official disputes over the expropriation process are ongoing and have the potential to delay the project further. Nor have residential units in New-Hasankeyf been completed. Finally, there has been no clear indication yet that the hydroelectric power plant is ready to operate. If we read the recent announcement carefully, the DSI states that the impoundment of water will actually begin with the closure of the third diversion tunnel. This cannot happen before six months, as the filling of each tunnel takes around 3 months, according to DSI statements1. The capacity of the three tunnels is so big that since the completion of these tunnels in 2012, a second tunnel has been used to divert the flow of the Tigris River for days at a time. Therefore, the closure of one tunnel does not affect the level of water downstream. Turkish government officials have stated in recent days that they will delay the impounding until July 1, 20182. However, since March 2018 they claim to take into consideration Iraqi concerns and delay the impoundment, but as technically the project is not ready to impound – see our argumentation above – this is only misleading news. Turkey refers to an action that it is not yet able to fulfill in order to suggest it is being flexible and cooperative. There are ample examples where the Turkish government has used dams as weapons against its downstream neighbors. While Turkey has not signed the UN Convention on Non-Navigational Use of International Watercourses from 1997, it idoes not feel to be bounded by international law to take into consideration peoples rights on the Tigris and Euphrates in Iraq and Syria. The Iraqi government should act promptly and firmly to use international legal and diplomatic mechanisms to protect the rights and interests of its citizens rights against Turkey and Iran. Finally we call upon the Turkish Government to suspend immediately its implementation of the Ilisu HEPP Project, which is causing widespread cultural and environmental destruction, threatens the economic and social well-being of all people in the basin, and increases the potential for conflict. The worldwide civil society is requested to demand the cancellation of the Ilisu Project until there is a new democratic, participative and transparent process on this project in Turkey which also includes Iraq and Syria. It is never too late to stop such a destructive and controversial project from which people and nature will not benefit!